A free, carefully curated range of workshops and presentations delivered by our world-renowned experts, designed to get secondary students excited about STEM. In2science is an innovative and proven multi-university schools partnership program where volunteer university science, technology, engineering and maths students are placed into year 8 and 9 classes in low socioeconomic high schools. 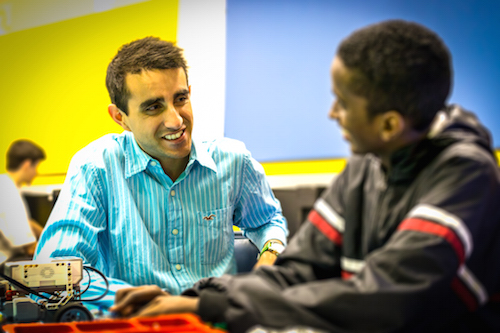 Mentors work as role models by sharing their enthusiasm for science and maths, helping students to achieve in class and encouraging them to continue with science and maths into VCE and beyond. Teachers appreciate the extra pair of hands and new ideas and activities brought to class by mentors. The University and schools value their ongoing partnership including direct links to current science and events. The Residential Indigenous Science Experience, aims to inspire students about the exciting and rewarding careers that can lead from studying maths and science. Developed by the University of Melbourne and the Gene Technology Access Centre (GTAC), the program is carefully crafted for year 9 and 10 students to experience the tangible and hands-on nature of science, including workshops and special presentations on chemistry, geology, genetics, physics and maths, and visits to industry. Every January the Faculty hosts year 9 and 10 students for a 3-day science summer program. Students get to meet other students from all around Victoria, and work through a fun, interactive program of activities. Our program is designed to provide students with the opportunity to experience university life with lectures, laboratory experiments and hands-on experiences run by our top ranking academic staff, all whilst exploring our world class facilities. There are only 100 places each year, register early so you don't miss out. The Faculty of Science will offer work experience to Year 10 students between 24-28 June this year. We will provide students with a sample of activities that are part of a career in science including conducting experiments, attending seminars, collaborating with others on research projects, and presenting their own findings. Students will discover what it is like to be a scientist by participating in interactive workshops and activities in a discipline of their choice. Participants will be able to enjoy meeting like-minded new friends and scientific role models, as well as get a taste of university life. While every effort is made to place as many students interested in the work experience program as possible, this is a very popular program and we are restricted by other University teaching and research commitments. At the moment, we can only offer work experience on the dates 24-28 June 2019. Please check this page regularly for any changes. Applications for 2019 have closed and we cannot consider other applications for this year. Students will be asked to select their top three preferences in science, and briefly describe why they are interested in those areas. Students will also briefly explain why they would like to participate in the Faculty of Science Work Experience program. Students will be notified on the success of their application by Friday 5 April 2019. For enquiries please send an email to science-workexperience@unimelb.edu.au. If high school physics is the study of gravity, centripetal forces, and energy transfer – then astrophysics builds on that to investigate dark matter, new galaxies, and how our wider Universe works. Biotechnology involves studying biological and chemical aspects of organisms to make beneficial products.In the age of genetically modified organisms (GMOs), human boundaries – like switching genes on and personalised drugs – are pushed daily. The Bio21 Institute is a leading research institute in medical, agricultural, and environmental biotechnology. From cells to ecosystems, there are countless aspects of biology that our researchers dedicate their careers to in University.This includes studying human nutrition through agricultural crops, creating novel proteins, and finding ways to conserve endangered species. How did humans build sustainable and innovative communities that spread worldwide? Engineering includes the study of the natural environment, transport, machines, buildings, and even humans. It strives to improve the physical structures that society is established on in ways that benefit both humans and the planet. The earth sciences deeply explores earthly phenomenon to understand how it has changed over time. While geology focuses on rocks and minerals in the ground, climate and weather focuses on changes in the air all around us. How did the world change from nothing but hot molten rock to a living, thriving planet? Geography is the study of how our lands, seas, and skies have evolved alongside our communities – and how we will always be intricately connected. IT is a rapidly moving field that explores the way we manage and store data. The flow of information across the world has become crucial for businesses, governments, and individuals. It is expanding human society to an entirely different platform, as more of our world goes online. Regarded as the root of all sciences, mathematics and statistics is now essential for millions of people to understand the growing amount of data in every field of study and work. It also helps us make everyday decisions – whether we know it or not. In science, the ability to truly observe phenomena has always been as good as the technology behind it. Be it tiny bacteria or even tinier nanostructures used to create materials that could change the world, nanoscale imaging is crucial to discoveries. Called “high energy physics”, particle physics explores all kinds of particles, and the forces that form the Universe. What makes up an atom, and in how many ways can it exist? Can we make new fundamental particles? How do we bring nature into our cities? Researchers at Burnley help design our city’s landscape by strategic planting on spaces such as roofs and walls, and also develop vegetation techniques to adapt to climate change – all of which will transform the urban environments of the future. Students will have the opportunity of living on campus in Burnley. The Science Delivery program is aimed at increasing the participation of students from low socioeconomic backgrounds in science, technology, engineering and maths (STEM). Current university students who have come from financially disadvantaged or rural backgrounds are recruited and trained as volunteer science presenters. The presenters develop and deliver interactive science activities in low SES high schools in one day programs, developing their communication, teamwork and project development skills. The students act as role models for high school students, reflecting on their personal experiences of university and encouraging students to engage with science in exciting and meaningful ways. Several schools within the Faculty of Science run VCE workshops and lectures. Strengthening Engagement and Achievement in Mathematics and Science (SEAMS) is an exciting opportunity for students to connect, interact, be inspired and discover the possibilities maths and science have to offer. The program, run in partnership with Monash University, aims to increase equitable participation and attainment in science and maths in higher education.